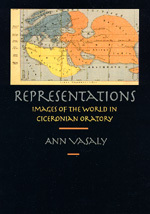 Ann Vasaly introduces representation theory into the study of Ciceronian persuasion and contends that an understanding of milieu—social, political, topographical—is crucial to understanding Ciceronian oratory. As a genre uniquely dependent on an immediate interaction between author and audience, ancient oratory becomes performance art. Vasaly investigates the way Cicero represented the contemporary physical world—places, topography, and monuments, both those seen and those merely mentioned—to his listeners and demonstrates how he used these representations to persuade. Her exceptionally well-written study deftly recaptures the immediacy of Cicero's oratory and makes a trenchant contribution to an important new area of inquiry in Classical Studies. Ann Vasaly is Assistant Professor of Classical Studies at Boston University.